Microsoft released Windows 10 to the world this Wednesday and the response has been terrific, with more than 16 upgrades per second. In order to deal with the considerable amount of data this would require, Microsoft acquired as much as 40Tbps with all of the major CDNs - the company was already consuming 10Tbps when that article was written. 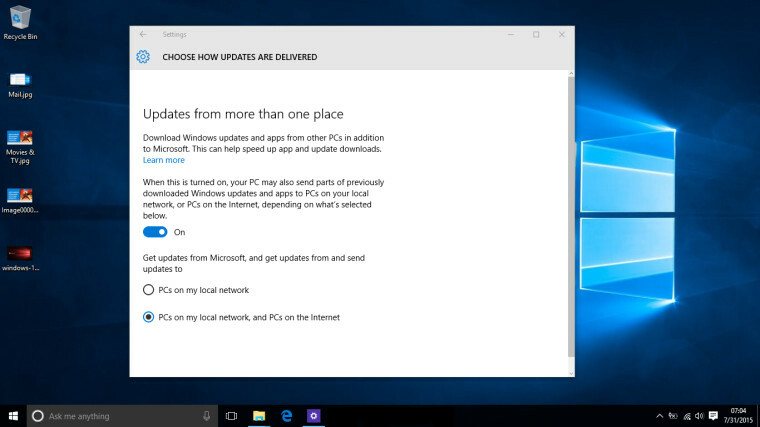 In order to alleviate some of the load on its servers and allow users to upgrade faster, however, Microsoft has introduced what it calls Windows Update Delivery Optimization, which works similar to a torrent, hosting the install files on local PCs and then propagating them to other PCs on either your local network or the internet. The problem comes in the fact that Microsoft has enabled this option by default and that no notice is provided to customers that Windows is, in the background, using some of their bandwidth and their data for updating other users' Windows. Several web sites have already called Microsoft out for this and what they - and other consumers - find to be misallocation of their network without permission. If you head over to the 'Updates and Security' tab in the setting page, under 'Advanced Options' you can choose how updates are delivered, which will lead you to the above page. From there, you can disable the option - in case you have a data cap - and can also alternate between allowing the PC to propagate updates to networks on the local network only or also those on the internet. The former might prove particularly useful for those households with slower internet connections as the update only needs to be downloaded on one machine and can, then, be passed on to other devices in the family without requiring too much internet bandwidth. While this is certainly a useful feature that makes the upgrade process smoother and much faster, some have already begun to complain that leaving this option on by default is detrimental to them. Microsoft has, for its part, clarified that the feature only used up a “limited portion” of idle upload bandwidth and while this may help with speeds, those with data caps might still not be satisfied.